Shephard “Fiction” Lima has been around the competitive Smash bend quite a few times. In 2008, he began his career in Super Smash Bros. Brawl, soon rising to prominence as one of the scene’s most skilled Wario mains. As Brawl’s metagame stagnated and the game became slower-paced and less aggressive, Fiction transitioned to Melee, quickly becoming one of the best players in his home region of Southern California. At his peak, Fiction was ranked No. 38 on the 2015 edition of SSBMRank, having taken three “god” wins—two over Jason “Mew2King” Zimmerman and one over Joseph “Mang0” Marquez—in his career. Shortly before Fiction’s career-high ranking was revealed, however, the Riverside native announced that he would be stepping away from the game due to fears over increasing hand pains eventually becoming debilitating and a desire to pursue his fledgling career as a video game developer. Though he didn’t retire, he significantly cut back on tournament attendance, primarily using Marth at the events he did show up to. This year, Fiction has quietly upped his participation in the competitive scene, returning to SoCal locals using his trusty Fox and creating some bang-up instructional content for players trying to get into the game. And last night, Fiction showed us that he’s just as good at the game as he always was, winning stacked Illinois regional Show Me Your Moves 19. Before the event began, Fiction made his distaste for the “gimmicky” playstyles that he believed were employed by many of the midwestern players at the event. Fiction was roundly criticized for the arrogance and seemingly unearned confidence that he signaled with his admittedly aggressive tweet. Soon, however, he backed up his words in electrifying fashion. 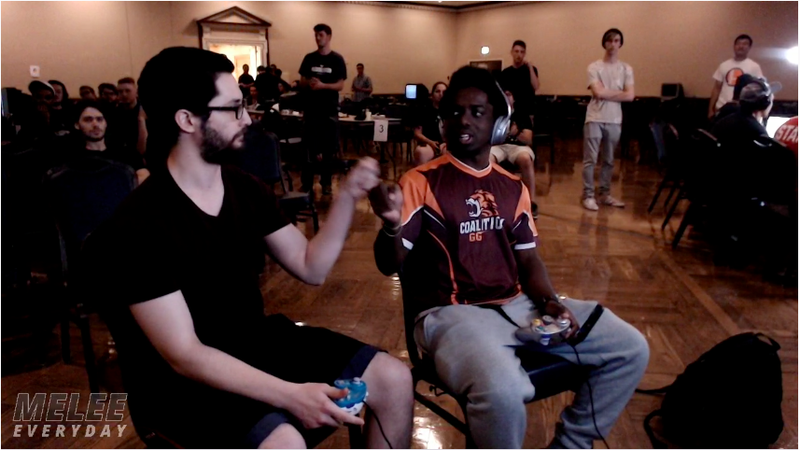 Fiction’s first Top 100 victory at Show Me Your Moves was in winner’s round two of the Melee bracket, where he 3-0ed Fox wunderkind Conner “Cal” Daughtery. In winner’s quarterfinals, Fiction lost a close five-game set to Avery “Ginger” Wilson, dropping down to loser’s bracket, where he made a run to grand finals that included victories over such talent as Kalindi “KJH” Jabari Henderson, Daniel “Zamu” Bernstein, and Drew “Drephen” Scoles. In grand finals, Fiction faced off against Charlie “AbsentPage” McKinley, who had himself put together an impressive run to winner’s side of grands by defeating Drephen, KJH, and Michael “Michael41000” Rollberg. Though AbsentPage looked strong at the beginning of the set, Fiction quickly heated up, finishing his rival off with back-to-back victories on Final Destination, AbsentPage’s preferred stage in the Fox ditto. Two games into the second set of grand finals, AbsentPage appeared to give up, all but conceding victory to Fiction by switching to Marth for the set’s final game. In one tournament, Fiction put together a resume that shows that he’s clearly playing at a Top 100 level at the moment, even after years of pseudo-retirement. All that’s left for the SoCal hero is to make a deep run at one of the year’s remaining major-level events. The biggest disappointment of Show Me Your Moves 19 was surely the relatively short run of Edgard “n0ne” Sheleby, who entered the tournament as its top seed. The 19th-ranked n0ne placed 9th at the event after losing to Matt “Boyd” Reymann in a 3-2 winner’s bracket set. In loser’s n0ne defeated Abhishek “Prince Abu” Prabhu only to lose to Michael41000 in his Top 8 qualifying match. For n0ne, this tournament is a wake-up call that the Captain Falcon main needs to spend more time developing his skills in the floaty matchups. Though Show Me Your Moves 19 didn’t feature any of Melee’s top 10 players, it provided plenty of evidence that a tournament stacked deep with talent from the middle of the Top 100 can be just as exciting as a more top-heavy event if its players are on a hot streak—and they were. Though there won’t be another Melee major until October’s The Big House 8, the next month will give plenty of mid-ranked players more opportunities to strut their stuff before the last supermajor of the year goes down in Detroit.